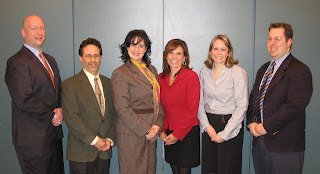 From L to R: Hank Grezlak, Mike Dunn, Gina Rubel (Furia Rubel), Lu Ann Cahn, Brandyn Bissinger (Furia Rubel), and Jeff Blumenthal. - Mike Dunn is the City Hall Bureau Chief and it’s his job to cover the newsworthy courthouse stories. He said that “raw natural audio tape is always helpful when it can be supplied.” He also said that his stories typically run for 45 seconds so lawyers need to speak in concise sound bites minus the legalese. - I shared a few thoughts on how lawyers and legal marketers can be great resources to the media and still serve the best interest of their clients. I reminded everyone to read Rule 3.6 of the Pennsylvania Rules of Professional Conduct concerning trial publicity. To hear the full podcast go to the Philadelphia Bar Association website and check out their speakers’ program podcasts. If it’s not immediately, check back in a few days.